I recently posted my list of master bathroom must-haves for the upcoming remodel of my and my husband’s 100-plus-year-old cottage in San Francisco. The response from readers was great, and so as I’m beginning the planning phase of our kitchen update, I decided to create a list of must-haves for the kitchen. Most of these are doable, but some are probably going to be cut due to space or budget constraints. I always advise clients who are about to undergo a major remodel or new build to start big and then whittle away items as needed. It may sound counterintuitive, but the more stuff you start with, the easier it is to slash items you can’t or don’t want to spring for. 1. Ample work aisles. Let me start off by saying that my husband and I both love to cook, so this will not be merely a “show” kitchen. Sure, I want it to look good, but it also has to function well. We also entertain frequently and, as anyone who hosts parties knows, guests always end up huddled in the kitchen. 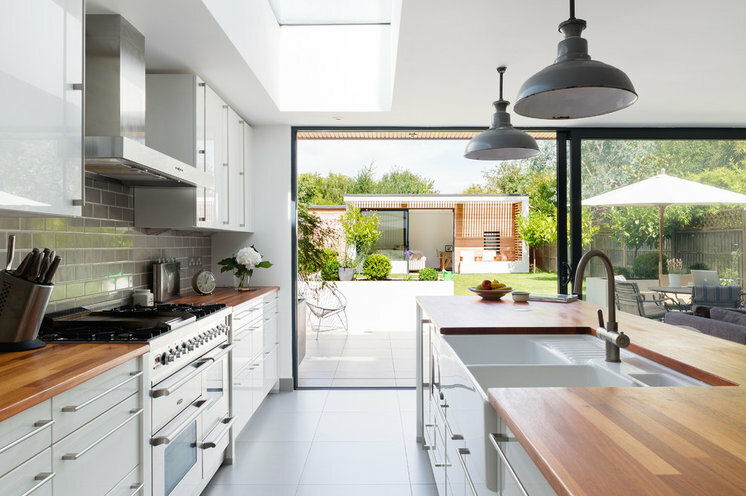 So for these reasons, an open kitchen with generously spaced aisles is very important to us. Tip: The minimum recommended kitchen aisle width is 42 inches. More comfortable, and the minimum I tend to design to, is 48 inches. If you live in a multicook household, I recommend upping that to 52 or 54 inches. 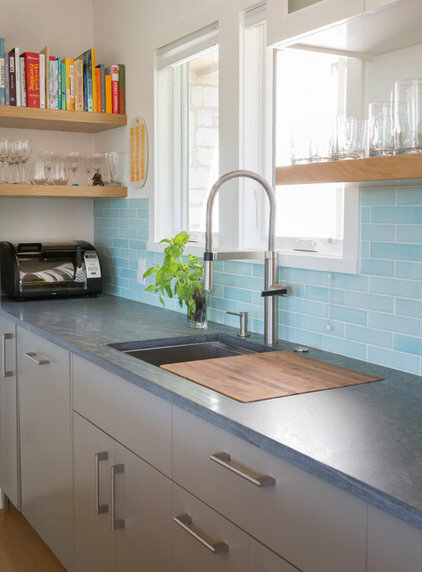 The extra space really eases tight spots, especially around the sink and major appliances. But bigger isn’t always better. I wouldn’t want to go wider than 54 inches, because then your kitchen can become inefficient — you’ll spend more time walking than cooking. 2. Drawers instead of doors. Given the choice I will always choose drawers over doors on my base cabinets. It’s so much easier to organize and find things when you can pull out a drawer instead of having to squat down to dig around deep inside the cabinet. Tip: Extra-deep drawers are great for storing dishes, pots and pans. I also try to fit as many wide (36-inch) cabinets in as I can, because these can hold all manner of items yet still be within easy reach. 3. Windows in lieu of wall cabinets. I am invariably drawn to interiors that are generously lit, preferably via natural lighting. Nothing beats a sun-flooded interior space — both to look at and to live and work in. 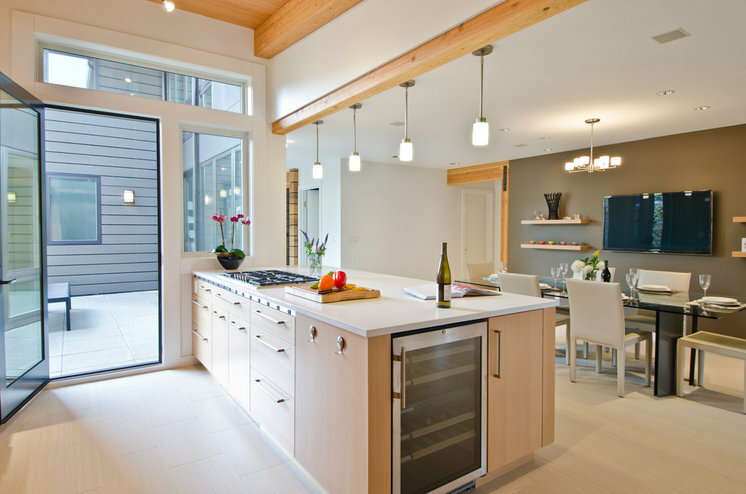 So when designing a kitchen, I tend to prioritize windows over wall cabinets on exterior walls. 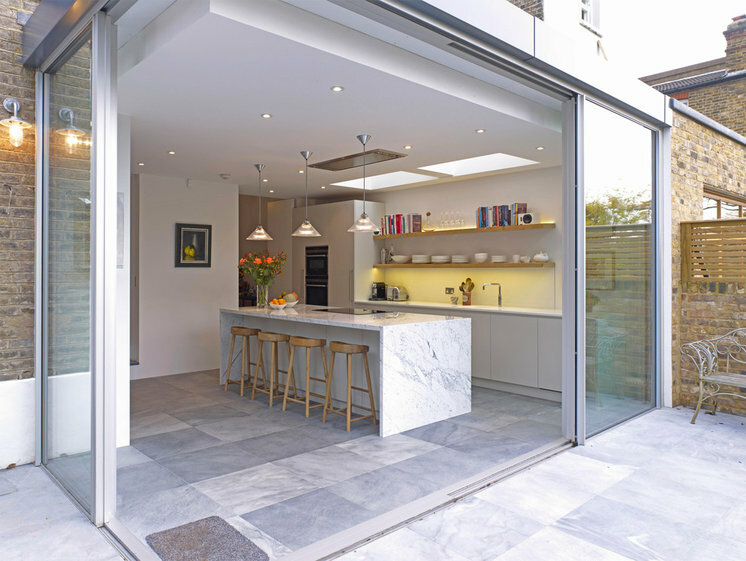 It’s incredible how much this visually opens up a kitchen, making it feel more expansive. And, as a bonus, the extra daylight cuts down on electricity, since artificial lighting often isn’t needed until after the sun does down. Tip: If you really can’t give up the extra storage you get from installing wall cabinets on an exterior wall, perhaps you can add a horizontal strip of windows just below your wall cabinets. 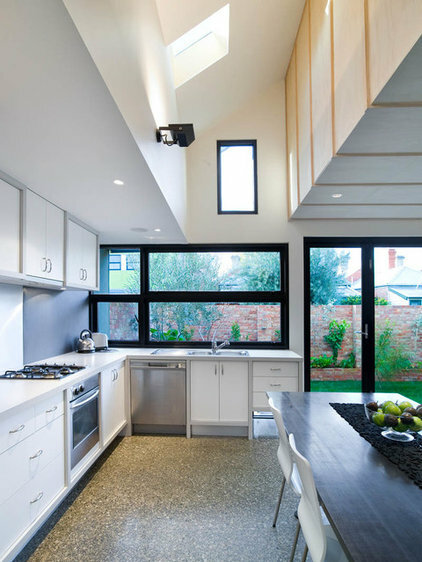 Or, if the view out the window is less than desirable, perhaps a bank of windows at the very top of the wall above the upper cabinets would also do the trick. 4. Pantry wall. To address any shortfall of storage created by choosing windows over wall cabinets, I plan to add a large floor-to-ceiling pantry wall. This will keep the bulk of the kitchen storage confined to one area in the kitchen, making it more efficient to find and grab what’s needed. Tip: Put a bank of floor-to-ceiling pantry cabinets on an interior wall, since you can’t have windows there. 5. Separate, full-size refrigerator and freezer. My husband is from Texas and therefore hardwired to feel the need to store at least half a cow’s worth of meat in the freezer at any given time. We also do lots of cooking and entertaining, so we tend to need an abundance of refrigerator shelf space. Our solution is to install separate, stand-alone freezer and refrigerator units. The ones shown here are 36 inches wide apiece, probably a bit wide for our space, but you can also find them in smaller widths, such as 32 inches, and even as refrigerator-freezer “columns,” coming in at a slender 24 inches. Tip: Tuck your refrigerator and freezer into a pantry wall. You can either put in counter-depth appliances or build out your pantry to match the depth of your appliances, for a clean, built-in, finished look. 6. Range top that’s 48 inches, with a powerful exterior-venting hood. We frequently cook elaborate meals from scratch, but baking? Not so much. So while I can put a 6- to 8-burner stovetop through its paces, an attached double oven would see absolutely no action. 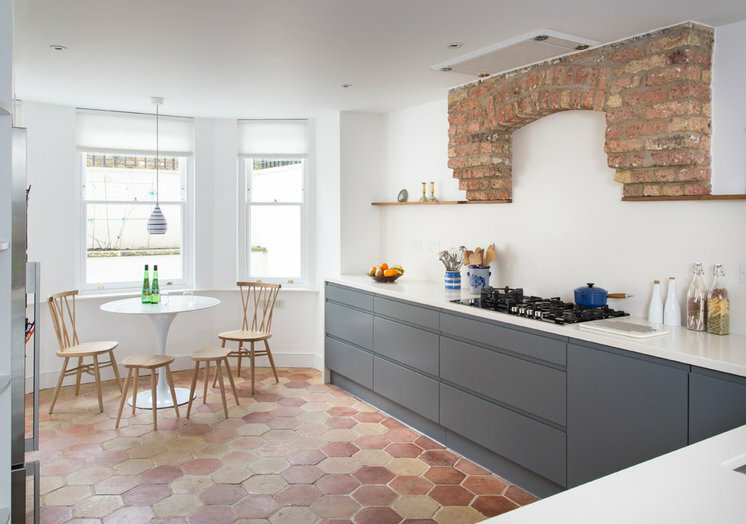 The plan, then, is to install a large cooktop — usually referred to as a range top (the controls are on the front rather than the top of the appliance) — and then a single, wall-mounted oven. 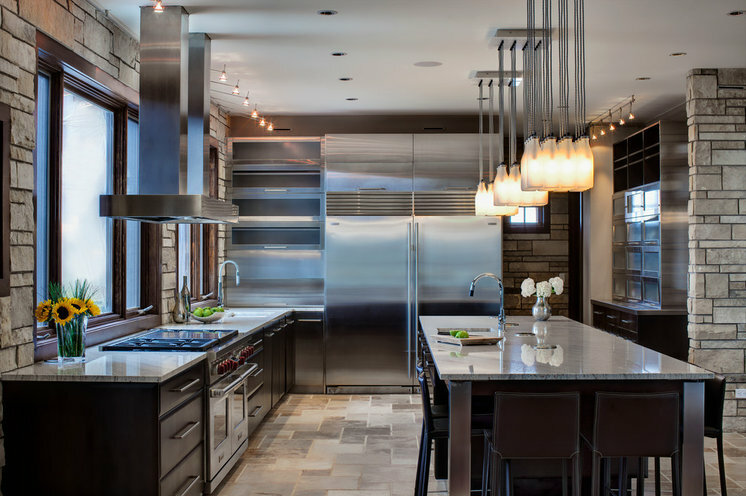 Tip: If you are an avid baker but don’t put in much time in front of the burners, you might want to install a nice set of double wall ovens, including a convection oven, then go with a standard 30-inch cooktop. 7. Undercabinet wine refrigerator. We live near wine country, which also happens to be earthquake country, so secure wine storage is a must in these parts. Tip: Even if, like us, you tend to drink mostly red wine, a wine refrigerator is still a nice amenity in the kitchen or bar because it will keep your reds at a constant, steady temperature. This is vital if your home lacks heating or air conditioning, something that is quite common here in California. 8. Quiet dishwasher. If you have an open-concept kitchen and you use your dishwasher often, you know the importance of a quietly running machine. Tip: If a quiet dishwasher is a priority for you, look for machines with a decibel level below 45. Keep in mind that the price of a dishwasher typically goes up as the decibel level goes down. If you can’t spring for a quiet dishwasher, look for one that has a delay setting (most of them have this feature nowadays) so you can set the dishwasher to start after everyone is off to bed or away for the day. 9. Loud disposal. I’m only sort of kidding with this one. During my last remodel I upgraded my extremely loud disposal to a fancy, expensive, quiet one, only to find that it was tough to tell when it was running. A couple of times I even spaced out and walked away while it was running, neglecting to turn it off. Fortunately I caught my mistake before burning out the motor, and nobody was ever injured, but it made me realize that, when it comes to disposals, a little noise is not necessarily a bad thing. Tip: I highly recommend installing an air switch (seen in this photo at the top edge of the sink). It’s a flat button that sits semirecessed on a countertop that, when depressed, uses a pulse of air to power the disposal on or off. It’s perfect for those times when your hands are wet or dirty, as it’s much easier to wipe off the air switch than a standard switch plate on the wall. It’s also a good option if your sink is situated such that there is no adjacent wall to house a standard switch. 10. Hands-free faucet. This is a wish-list item I happen to already have installed in our current kitchen, and I plan to reuse it in the new kitchen. The faucet shown here is a Delta Pilar Single Handle Touch faucet, which you can turn on and off by touching anywhere on the faucet. 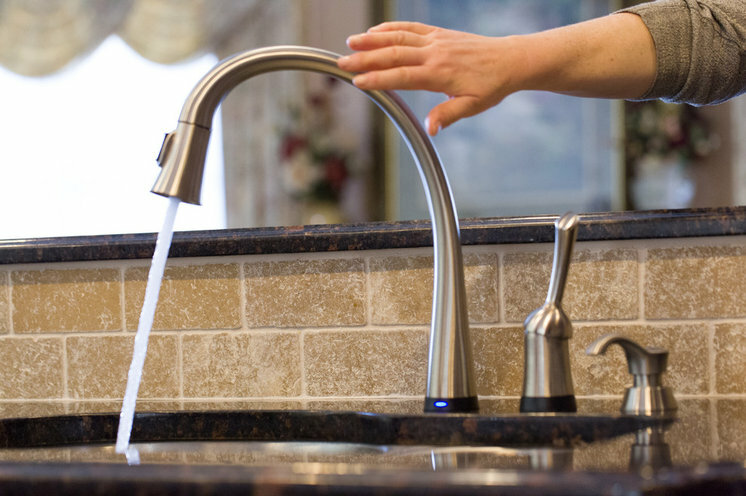 Our faucet is the Kohler Sensate, which you turn on and off with the wave of a hand in front of a sensor embedded in the neck of the faucet. It’s responsive, hasn’t randomly turned off or on, and keeps me from making a big, wet mess on the sink deck. Tip: I’ve heard stories of house cats that have figured out how to turn these faucets on and off, and like to play with the water, so be aware if you think your own kitties might be hands-free savvy. Fortunately our cats seem to be too afraid of water to mess with our faucet. 11. 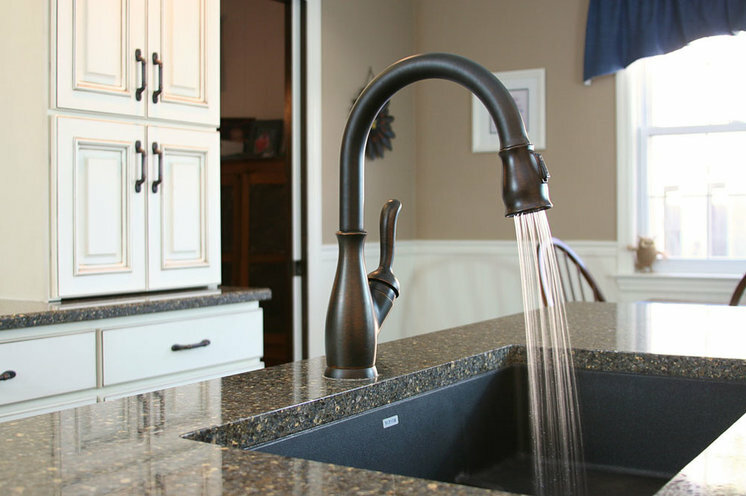 Single-bowl granite composite sink in a dark color. Our current kitchen sports a white cast iron sink that is the bane of my existence. All it takes is one splash of coffee or red wine for it to become instantly stained. I’m tired of the work (and chemicals) required to keep it looking clean and bright, so I’m definitely ready to replace it with a darker, lower-maintenance gray or black granite composite sink, as shown here. I had one of these in a previous home and loved its durability and the minimal work required to keep it looking clean. I’m also a fan of the large single-bowl sink, as it can easily fit my largest pots and pans for soaking. 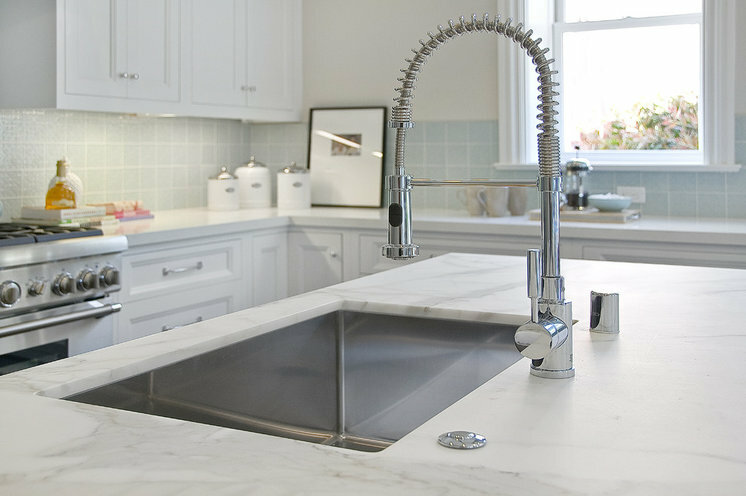 Tip: Undermount your sink for easier kitchen cleanup. 12. Extra-large island. Prepping and preparing meals is much easier when you have ample workspace, so I love a large island. A standard run of countertop is typically 24 inches deep, but with an island you can expand that to 36 or 48 inches. The extra foot or two of depth also allows much-needed space for entertaining. My husband and I are also quite tall, so we plan to raise our island height up from the standard countertop height of 36 inches to 40 inches. 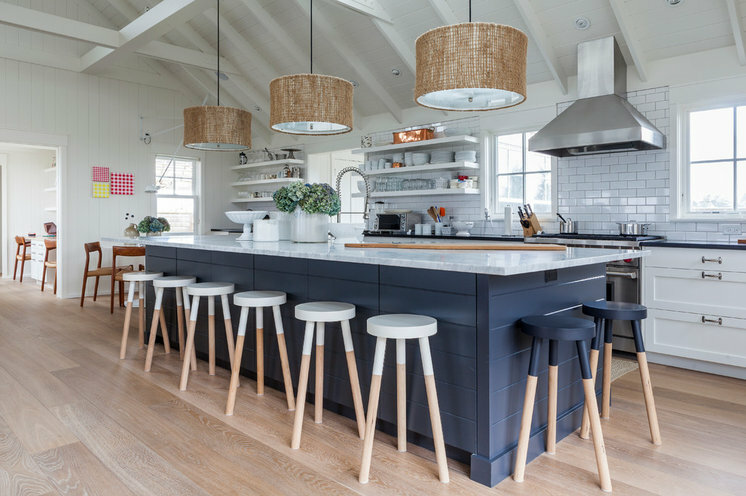 Tip: If your island will be serving double duty as an eating area, think about providing seating on at least two sides so diners can more easily face one another. 13. Honed Pietra Cardosa countertops. Every designer has a personal favorite countertop material; Pietra Cardosa is mine. Pietra Cardosa is a type of natural stone called a schist — a coarse-grained metamorphic rock formed from layers of different minerals. Its beauty is not exactly maintenance free; it does require sealing about once a year to keep it looking pristine. I’m willing to take on the upkeep, because I think it’s a stunning material. Tip: Want the look of stone but prefer a zero-maintenance material? 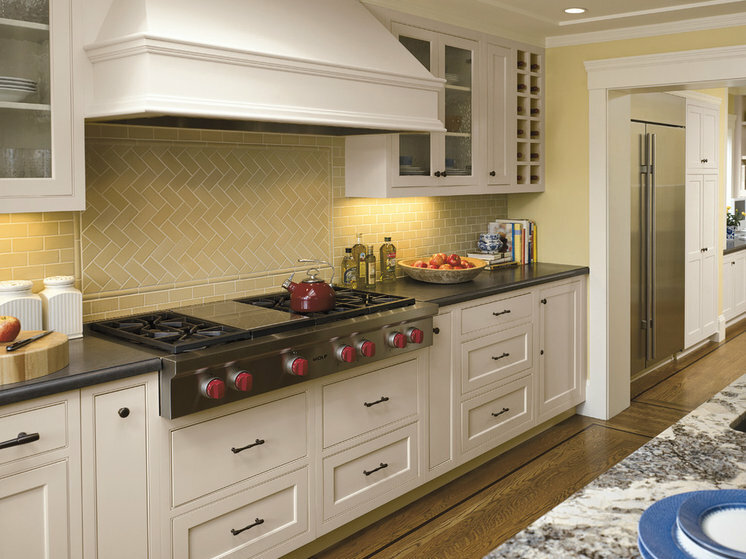 Check out the many options for engineered quartz countertops. 14. Durable, low-maintenance flooring. As much as I am willing to put a little bit of work into maintaining my countertops, when it comes to the flooring material, fat chance. I want flooring that can really take a beating. That is why I am looking at concrete and porcelain tile. I know many folks experience joint paint if they stand on hard surfaces for long periods of time. I’ve managed to avoid this by donning a pair of (ugly!) orthopedic flip-flops when I’m on my feet for long periods of time in the kitchen. Tip: If you are considering a porcelain tile for your floor, go for a color-body or through-body product. This simply means the color you see on top goes all the way through the body of the tile, versus a glazed tile, for which the color is just a coating on top of the clay body. That way should you nick your floor, the chip won’t be as obvious. 15. Color! This photo shows my remodeled kitchen in my previous home — no white kitchens for me. 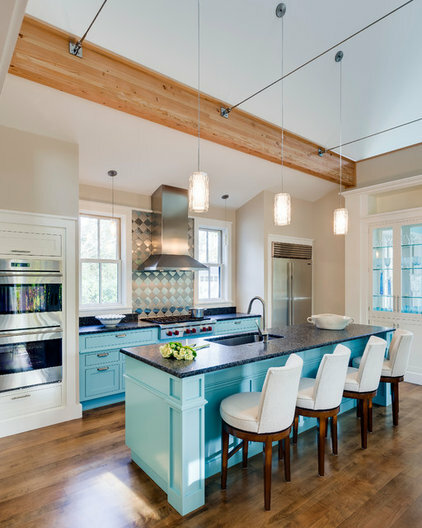 This is not meant as a put-down of white or neutral kitchens; as you can see, I’ve featured several here, and they are all stunning. But I’m a fan of big, bold colors and plan to incorporate color in a fun way in our new home. 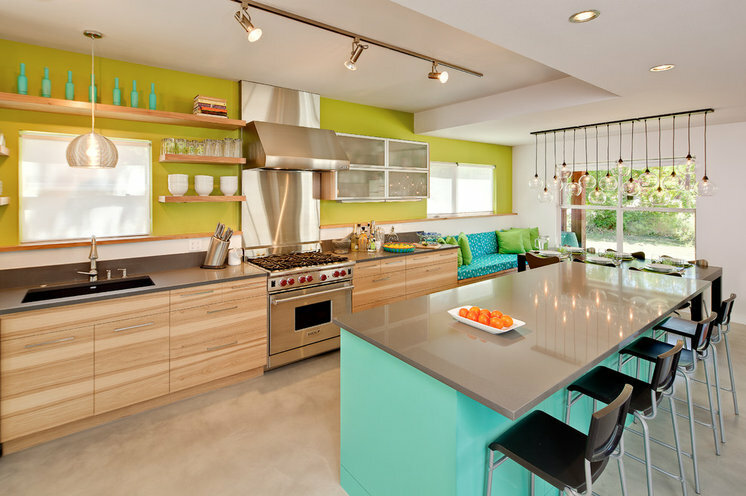 Tip: Keep your countertop and flooring a neutral hue, and save the more assertive color for components that are relatively easy and cheap to change, such as paint and decorative items. Tell us: What would be on your own kitchen must-have list? Please share in the Comments below. We might use it in a follow-up feature.